What is One Day Give? 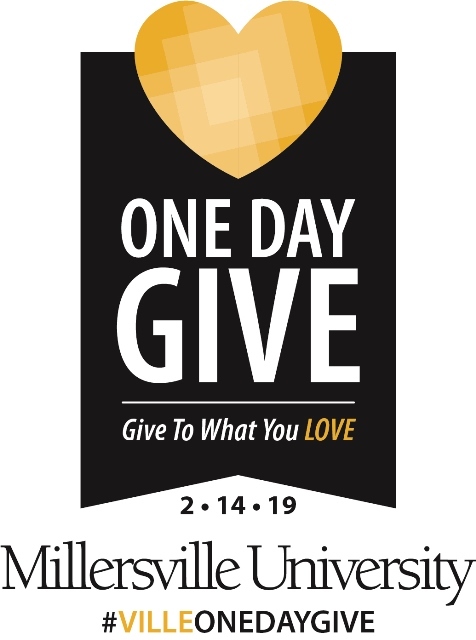 One Day Give is a one-day online giving campaign designed to inspire support from every member of the Millersville community. The theme for this year’s campaign is “Give To What You Love.” The 2019 One Day Give will be held on Thursday, February 14, and the event will last for 14 hours – from 6:00 a.m. until 8:00 p.m. – in celebration of Valentine’s Day. We will also leverage a sense of urgency through “giving challenges” as donors follow the progress of the campaign in real time throughout the day. The goal is to demonstrate that philanthropy – at any level – has an impact! Thank you for your willingness to support this year’s effort. As an ambassador for #VilleOneDayGive, you can inspire others to give back and support today’s students. Please use the sample posts, templates, and logos as a guide to spread the word. Feel free to edit and customize posts as appropriate. Goal: Give To What You Love – support the area or areas of Millersville you love best! Make a gift! | The best way to support Millersville on #VilleOneDayGive is by making a gift yourself. This is a great opportunity to Give To What You Love! Any amount, to any area of the University, will add up and make an impact. If you have made a gift yourself, it is easier to encourage others to join the cause! Post to social media networks | Use the social media templates and images to spread the word about #VilleOneDayGive. When you make a gift, tell your fellow Marauders and encourage them to join you in supporting Millersville. Share why you give to what you love at Millersville, and where you are directing your gift to support what you love best. Tell your friends directly | If you are with fellow Millersville alumni/students, personally ask them to get involved and spread the word. Use the provided email template to reach out and encourage your friends to join #VilleOneDayGive. Imagine the impact you can have if all of us ask just three other friends to make a donation this year! Make sure to use #VilleOneDayGive in any of your One Day Give social media posts – it helps spread the message of the day. On Thursday, February 14, let’s take over social media! Spread our message by sharing the One Day Give logo below on Facebook, Instagram, Twitter, or any other social media. Make it your profile photo to show the world your love for Millersville! Not sure what to post for One Day Give? Here are some samples to get you started – or even copy and paste! If you are short on time, you can share or retweet posts from the Millersville University or Alumni Facebook, Twitter and Instagram accounts. Save the date for the sixth annual One Day Give – Thursday, February 14. Celebrate this special day of giving – Give To What You Love during this 14-hour one-day online giving event, in support of funds and scholarships at Millersville University. Today is #VilleOneDayGive! I’m supporting my alma mater this year and giving to what I love with a gift to Millersville’s ______ (area of support). Join me and make an impact! Imagine the difference we can make if we all come together on this single day. It’s Millersville’s One Day Give. I made my gift and gave to what I love. Did you? Be counted and show your support for #VilleOneDayGive at millersville.edu/give2mu. Post one of your favorite photos from your time at Millersville, and be sure to use #VilleOneDayGive. I’m writing to my Millersville friends to spread the word about #VilleOneDayGive. I just made a gift to the _________ (area of support). I want to invite you to join me today and give to what you love with a gift to the area or areas of the University you love best! 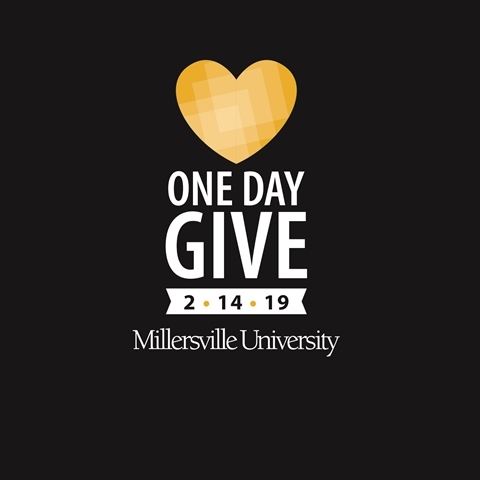 millersville.edu/onedaygive Regardless of the size of your gift, together, our support on this single day can add up to make a huge difference. This February 14, give to what you love and support Millersville! For more information about Millersville’s One Day Give, please visit millersville.edu/onedaygive. You can follow our social media throughout the day and share your Millersville pride! If you have any questions, please feel free to contact Corinna Linn, Director of Development Communications, at 717-871-7520 or Corinna.Linn@millersville.edu.